Not since 1928, when Harry Burnett Reese combined chocolate and peanut butter into the iconic Reese’s Peanut Butter Cup, have two unlikely characters come together to produce something that can bring such joy! 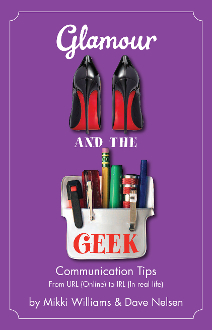 Glamour and the Geek brings together the skills and knowledge of two world-class professional speakers, Mikki Williams and Dave Nelsen, and distills their years of experience and knowledge into a delicious, delectable and informative book. This is a book you’ll want to consume many times, and share with friends. It’s that good! Lucy and Rick, Sonny and Cher, Batman and Robin… and now the newest dynamic duo: Dave Nelsen and Mikki Williams. WOW! The two distinct flavors of these two very different – and equally powerful – communication/leadership forces complement each other. Social media tips and speaking and storytelling skills are the very things all executives need in their toolbox. And these professionals deliver! Mikki Williams and Dave Nelsen are masters of the art of communication. Communication is the key to success, whether on a stage or carried by electrons, and these two are great at it. This book is engaging, straightforward and worthwhile! I get new tips and tricks every time I pick it up.